At 72, Barb Bletzer has been a vital part of the Akron Children’s Hospital Mahoning Valley volunteer team since the hospital’s inception. Upon retiring from the Boardman Police Department after 25 years of service, she realized she didn’t want to be a couch potato. It wasn’t long before an ad in The Vindicator revealed her next calling in life. Five years and 2,000 hours of service later, Barb can add another accomplishment to her resume: the President’s Volunteer Service Award. She arrived before the Boardman campus even opened, training to volunteer at the front desk as well as run the craft cart and book cart to children in the hospital. 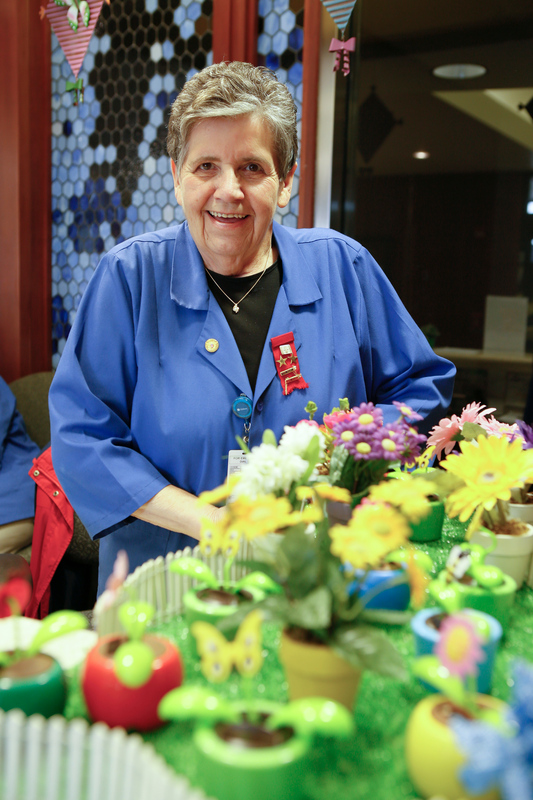 One of her biggest contributions to Akron Children’s Mahoning Valley is the vibrant decorations that adorn the front desk year-round. Barb sees her attention to detail as a reflection of the attention patients and their families will receive during their stay at Akron Children’s. Last May, Barb was diagnosed with Stage I lung cancer. She underwent surgery and five months of chemo treatments, but still managed to deliver her decorations to the front desk, never missing a holiday. Barb credits much of her recovery to her Akron Children’s family. Receiving the President’s Volunteer Service Award came as a welcome surprise. “It arrived in a plain, standard envelope, so I was really floored when I opened it,” Bletzer said. As she received her award in January, Barb looked out at the people there to support her: her niece, her best friends, and her Akron Children’s family member, JoAnn Stock. This is just one example of the selflessness and compassion that makes Barb a volunteer worthy of presidential recognition. But Barb doesn’t see it that way.